It Just Hit Me: I Actually Ran a Half Marathon! As I was walking back to my office after lunch yesterday, it hit me: I ran a half marathon. I guess because I’ve been so annoyed about finishing much slower than I expected to, I haven’t really reflected on the accomplishment. Instead I’ve just been so focused on a redemption run and proving to myself that I am better than what I did on Sunday. But really, what I did on Sunday is exactly what I set out to do. Build up enough endurance to go the full distance of a half marathon. 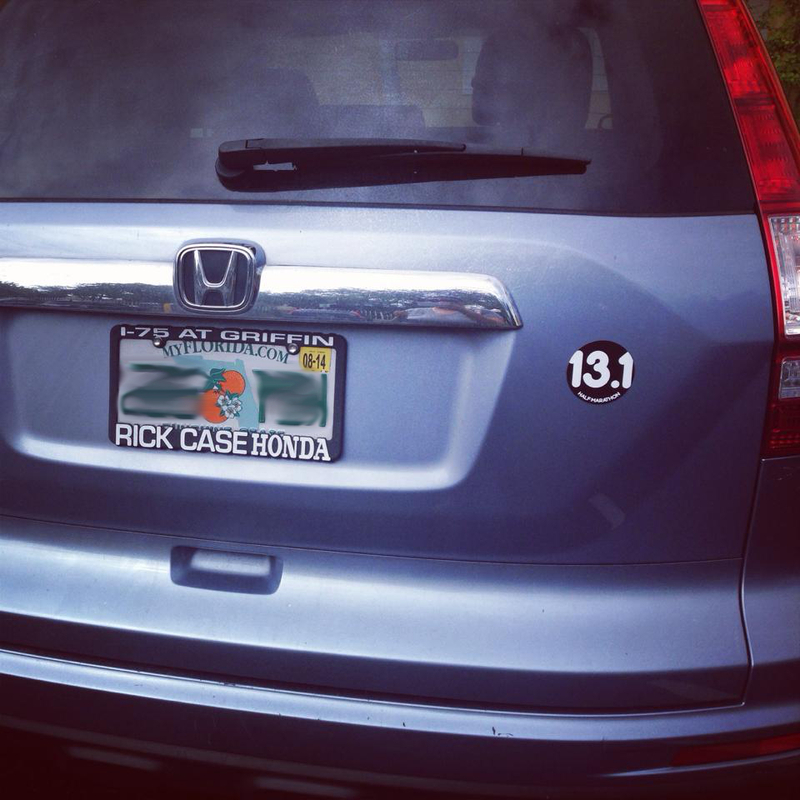 This actually hit me as I was walking by my car and I looked at MY 13.1 magnet. I remember looking out for these magnets during all of my training runs. Back when I was only running 3, 4, 5 miles I used to obsess over getting to put one of the magnets on my car one day. The idea of the magnet actually helped pull me through some tough training runs. Seriously. And now I have the magnet on my car. Excuse me while I cry for a minute because apparently running has made me into a very emotional person. I remember when I first ran 7 miles and then 8 miles. I would wonder if I could ever possibly make it to 13.1. Those miles were so hard. And of course after I got to 10 and 11 miles I started getting scared because that was really hard. Turns out it is possible and now I really want to enjoy this accomplishment. 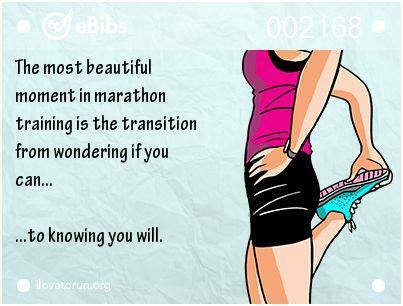 I still want my redemption run, but I am not going to obsess over getting it in. Instead when I got home from work yesterday I put on my finisher’s medal and wore it around the house all night. Why? 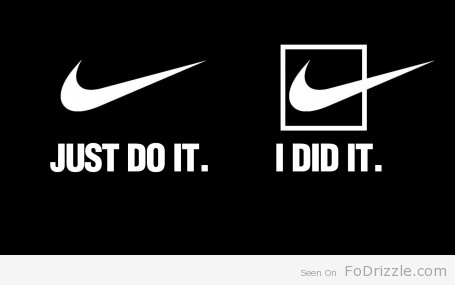 Because I earned it! Did you read the WSJ article about runners and magnets? Love it! You go girl! Isn’t it the coolest feeling to reach your goal and then to reflect back on it? YOU ran the half marathon, and no one can take that from you! Yes, it is absolutely the best feeling ever!! I love how running teaches us that we can conquer anything. One day, 4 miles seemed impossible. Then you’re running 13.1. Magic! It really does feel like magic! At some points I thought 3 months of training seemed really long, but looking back I can’t believe it happened so fast! Congratulations! You are a member of the half marathon club!!! To be a member of this club you just have to do it – final time makes no difference whatsoever. Be sure to celebrate what you have accomplished because it is HUGE. “Oh the parts of running you just don’t know about when you first start out” you said it! I had no ideas this was a “thing” for runners! haha The Immodium idea is an interesting one, I might have to try that out next time to avoid what happened last weekend! Thank you! I have been sick so long I am behind on my blog reading! Congrats on finishing the half! Just enjoy it 🙂 It’s a huge accomplishment. I laugh though because as soon as i finished one I almost couldn’t believe it actually happened so i want to do it again! Thanks so much Karen! I am SO ready to get back to running now 🙂 Recovery time is a killer! I love that you got your magnet! And running makes me very emotional too! I’m not a crier or overly emotional person at all, but there’s something about running that does it. Don’t worry about a redemption race. You’ll get your time for sure.